Previously whenever my hair grew past my shoulders it would get really thin and straggly but recently I've found a few ways of taking care of it, keeping it healthy and looking thick and as a result, it feels so much better. In terms of the health of my hair, I love using Coconut Oil. This makes it super shiny and also helps it grow a little bit quicker than usual, I use this about once a week and just apply it onto dry hair, leave it for about half an hour and then wash it out. You can purchase it here for £8.99*. Another treatment product I use is the Simon and Tom Moroccan Oil Treatment. I use this every three days or so after I have washed my hair, I apply it on the bottom section of my hair (from around my ears downwards) and then dry and style my hair as usual. This is great for keeping your hair soft, to stop frizz and protect it from heat and any damage! You can buy it here and here for £29.99*. 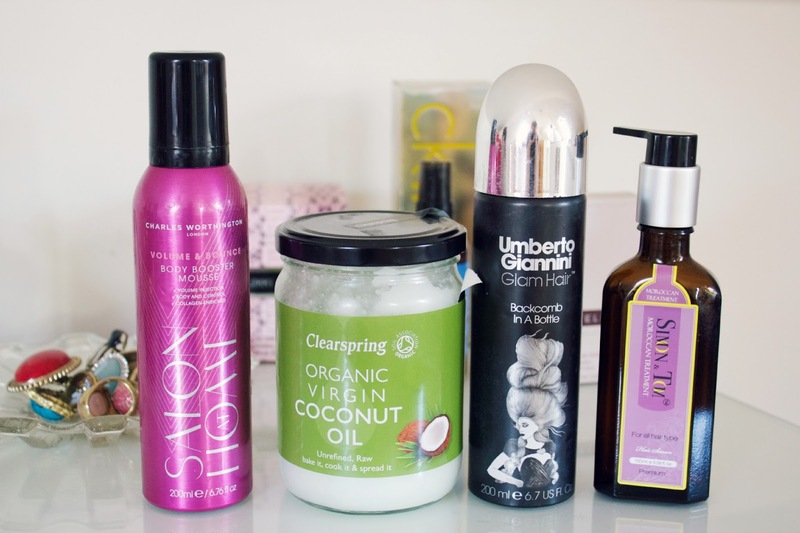 In terms of making my hair look thicker my favourite two products are the Charles Worthington Body Booster Mousse and the Umberto Giannini Backcomb in a Bottle. The mousse is great for creating volume and it makes it slightly easier to style my hair, it also smells amazing! Available here for £5.99. Finally is a product I've used and relied on for years, the Umberto Giannini Backcomb in a Bottle. This product is incredible, I backcomb my hair and two minutes later it is flat again so this product is a godsend for making my hair look thicker than it is, it just adds volume and gives my hair more life! It is available here for just £6.00! As I said, these products have really improved the health of my hair and help create more volume in my naturally lifeless hair! I really love the Charles Worthington spray, it does wonders for my thin hair!